PHOTOS: Alberta Finance Minister Joe Ceci, dressed in a sombre blue suit, delivers the fiscal report to predictable reactions from the opposition. Below: Wildrose finance critic and chief sloganeer Derek Fildebrandt as he appeared yesterday. Given the history of this province and its current goings on, our various stripes of conservative really had to tie themselves in knots yesterday to put their complicated spin on the state of Alberta’s finances after Finance Minister Joe Ceci delivered his first-quarter fiscal report. It’s pretty hard to blame the NDP for the mismanaged state of the province when the government of Premier Rachel Notley has been in power for less than four months and it was self-evidently one of the two conservative parties, which trade members like baseball cards, that set the province up for the financial troubles it now faces. It’s even harder to blame the NDP when the conservatives’ federal evil triplet is running hard to save itself from electoral defeat by desperately insisting it was things that happened in other places, which it maintains have nothing to do with to do with how Canada is being run, for the mess in which the country finds itself. And they only have one policy prescription – cut, cut, cut – and if the results of the May 5 provincial election show nothing else, it’s that Canadians, even supposedly conservative Albertans, are growing increasingly suspicious that austerity is nothing but a scam to benefit the tiny special interest group that conservative parties nowadays tend to represent. Derek Fildebrandt, the Opposition’s finance critic, is a talented sloganeer – he accused the government of having no plan, only a brochure. That’s cute, and quite quotable. The trouble is, the Wildrose plan isn’t much more than a nasty religious tract itself, one that promises a lake of fiscal fire for those unprepared to endure pain and more pain. Some exceptions apply, of course. 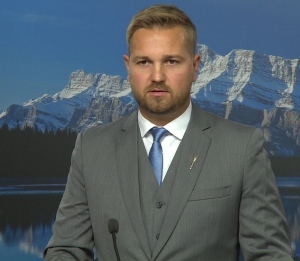 Mr. Fildebrandt’s attack on the provincial NDP echoes the talking points of the attack on the federal NDP by Prime Minister Stephen Harper and the Wildrose Party A-Team in Ottawa … “risky experiments” and all. Well, we’ve had a 30-year risky experiment in this province since Peter Lougheed stepped aside as PC leader in 1985, and how did that work out? Well, he should know how that works! It’s what the PCs did every quarter as long as anyone can remember. Indeed, if the NDP’s figures sound funny to PC ears, it’s probably because for the first time in a generation they haven’t been cooked for political gain. The Alberta Party? After the Big Consult and the Big Coffee Party, all the Alberta Party has for a policy prescription is Big Cuts, just like all the other conservatives. “The previous Conservative governments weren’t able to balance Alberta’s budget in five of the last six years when oil was averaging about $90 a barrel. “They threw away our opportunity to save and prepare for these challenges. “They failed to diversify the economy, failed to ensure that those who could were paying their fair share, and failed to save for a rainy day. “Now conservatives, of all stripes, want us to make things worse. Businesses are going through tough challenges and conservatives believe the solution is to fire thousands of more people, including your communities’ teachers and nurses. We aren’t going to do that! “In tough times, Albertans rely on their government to protect their families and invest appropriately to restore prosperity to their province. … We’re dealing with a significant revenue shortfall. We’re addressing it. But those decisions will be made carefully and responsibly and in consultation with and in the best interests of all Albertans. I have quoted Mr. Ceci at length because, for some reason, not much of his pitch-perfect commentary made it into mainstream media reports, although to give them their due, the staff of the Edmonton Journal included a recording of them with their story. The two faces of Jason … how’s managing simultaneous provincial & federal political campaigns going for Janus Kenney? WRP’s Fildebrandt advocating policies equivalent to prescribing leeches to cure disease. excerpt: ‘Economists have been underestimating the harm caused by pulling back on government spending, according to new work from economists Òscar Jordà and Alan Taylor. Mr. Ceci is clearly a classy guy. He avoided the no doubt tempting urge to point out that for the Conservatives, even when oil revenues had been deliciously high…… math had clearly been difficult. Didn’t vote for the NDP but I agree with this statement exactly. People gave the PCs 44 years, at least give the NDP 4. They cannot be to blame for Alberta’s economic problems after only being in power for such a short time.